As mentioned in my last post, I’m back from my trip! I meant to do an inventory last weekend, as mentioned in my last post, but jet lag got the better of me. I had a ton of other stuff to catch up on as well so there was no beer related activity. Fortunately, Mikey and I got back into it with an easy kit IPA; I’ll be writing this up later. We also managed to taste a couple brews. I did this inventory because I had a lot of home brew floating around the house, stored in different places. I also had stashed empty bottle in various places. It was good to pull everything out, get everything organised, and see what I had left. 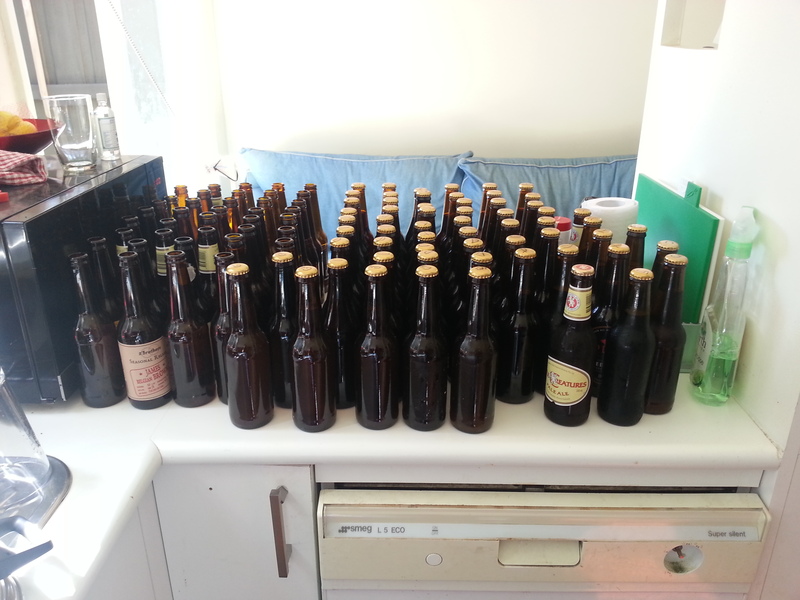 That’s 58 bottles of beers (including the Little Creatures) to work through! Finally, let us all take a brief moment of silence for all the tasty home brew that was so good I drank it rather than saved it. It will be missed until I make it again. Anyway, I’ll be posting up yesterday’s brew soon, and there are some reviews coming as well. Stay tuned.